John Sharp, MSSA, PMP is Senior Manager, Consumer Health IT for the Personal Connected Health Alliance at HIMSS. His focus is on patient engagement technologies. 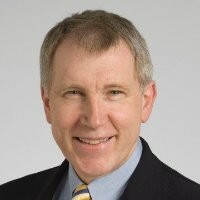 John is active on social media and blogs weekly on LinkedIn about connected health. He is also adjunct faculty in the Health Informatics masters program at Kent State University teaching Clinical Analytics. John is also a Project Management Professional. His bachelors and masters degrees are from Case Western Reserve University in Cleveland. He has published several book chapters and journal articles on topics ranging from social media in health care to eresearch and patient registries. He works at the HIMSS Innovation Center in Cleveland.